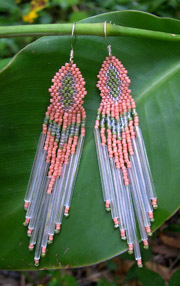 These earrings are authentic Native American made with high quality Delica seed beads in a brick stitch pattern with strong nymo bead thread. The total measurement is 3 ½ inches long. These earrings have silver plated French Hooks for pierced ears. This pair has sold, but it can still be made in any two colors you choose to go with the Crystal Iris Aurora Borealis bugle beads.